Plans for a super tower that will be more than a mile high in Japan have been revealed. 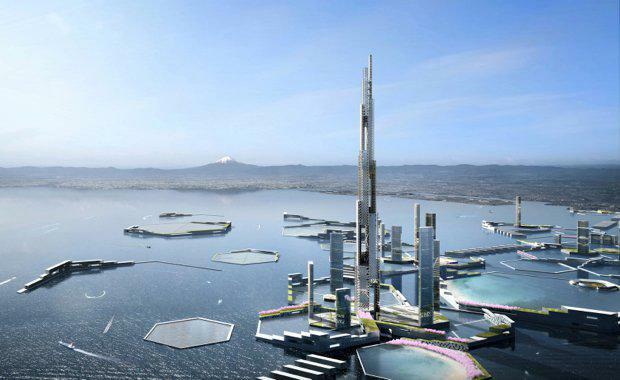 According to the New York Post, architectural firm Kohn Pederson Fox and engineering firm Leslie E. Robertson Associates revealed they plan to build the tower in Tokyo Bay, Japan. The Sky Mile Tower will be the centrepiece of a mini-city development called Next Tokyo that will house approximately 500,000 people. The tower would stand 5,577 ft high (the Burj Khalifa in Dubai is 2,722 ft high) and would hold a tenth of the population. It would be completed in 2045.